Mariah Lester is an aspiring racing journalist about to enter college, where she hopes to lay the foundation for a career in writing about the recently discovered sport she loves and horses such as her local hero Stopshoppingdebbie, Queen of Emerald Downs, who opened the door to a wonderful new world. Because of her passion, astute writing style, and ability to tell her story in a captivating manner, I felt this piece written by her would be of interest to our readers and to all young racing fans. On very rare occasions I come across a story that deserves to be shared. More and more young girls are getting into racing journalism, thanks mainly to the internet and its many outlets acting as a starting off point. Count Mariah among them, and someone who appears to have a bright future. For someone living near a lesser known track with the inability to travel, G1 winners, especially multiple G1 winners, are typically only seen on screen. These are elite horses, the ones who dominate the sales ring, the ones coveted by the breeding industry, and the ones who shine the brightest as beacons of hope for the sport. They bring in new, young fans wherever they tread, and keep old fans perpetually enthralled at how truly glorious the sport can be. But, as stated, seldom do these champions visit smalltime tracks. 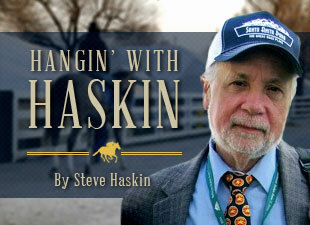 Seldom could someone in the far flung corners of American racing be in the presence of their equine idol at home. Thus, while thousands go to watch these G1 champions in their races, there are many more who seldom witness them in victory, with their home tracks seldom trodden by these stars. But there’s still a way to experience the rush and thrill of a champion’s win. In my life, just over two decades, I find myself humbled and incredibly lucky to have had such an experience. Maybe it wasn’t to the deafening roar of the surreal thrill of American Pharaoh’s Belmont win, or the nigh unattainable spectacle of Black Caviar’s flawless career. But make no mistake: Stopshoppingdebbie was a star, and the Queen of her home track during her racing career. I wish today to tell the story of myself, and how this incredible mare cemented my young love of horse racing. In truth, horse racing was what began my love of horses in the first place. It harked back to my Grandpa’s stories and frequent visits to local farms in the plains of Oklahoma. At the age of 13, a beloved horse of mine had passed away. We were extremely close, and to deal with the grief of this tremendous loss I returned to the roots of my passion: Horseracing. The first star that I ever followed was the then-Queen from Down Under: Black Caviar. In her I found joy amidst my anguish through the thrill and consistently new heights she would continue to reach throughout her career. This was my first dip into horseracing and was already a testament to the international draw that these magnificent animals can have in the world. However, this very fact was also an obstacle. Of all of Black Caviar’s 25 races, I only was able to witness three. Three races, late into her career, on the small screen of my laptop at 12 a.m. Otherwise all news of her was found in the morning, which was already the next day for Australia. Thus, while Black Caviar’s feats were incredible, they were distant and echoing. My tether to the sport was weak as a result, as she was the only horse I cared to consistently follow, aside from my new habit of watching the Triple Crown--and only the Triple Crown—races; a series of races that had, up until very recently, foiled all comers to it. Afterwards I wouldn’t care to follow up on any of the horses that had run in them. This would start to change, though, when my mom started taking me to our local track of Emerald Downs. Captivating as racehorses were on screen, their sheer majesty cannot be comprehended in the flesh. Their coats gleamed like polished metal, their almost greyhound-esque physique was surprisingly lithe and fluid. There was not a single movement of their beautiful forms that didn’t flow effortlessly into the other. Most of all was their presence. They had a youthful and unadulterated vigor and were raring for their upcoming race like a trap about to spring. Yet when I once again took up the riding that I had stopped since the death of my companion, I stopped going, with my love of equines sated by my weekly interactions at my riding school. I still kept up with races, but loosely and complacently. Then a friend of mine had told me that there was an up-and-coming star at my local track who went by the name of Stopshoppingdebbie, already on a four-race winning streak at her home track. As these convoluted horse names can often be, her name was rather amusing to me. When I delved deeper I realized that she was anything but funny. She was all business. I followed her for a while on social media, but then it occurred to me that this presented a unique opportunity for me. For the first time in my life, a champion was within my reach, I would actually be able to see her. So, upon her next race I decided that I would attend, and it changed my life. As usual, the Thoroughbreds before me were proud and beautiful, but Stopshoppingdebbie stood out most of all. The daughter of the mighty chestnut, Curlin, was a plain bay coloration that belied the innate calm and confidence she bore that commanded respect. She knew exactly who she was, and you could tell that there was a mind in her beautiful head that was laser focused on her job. Where all the other fillies and mares were prancing and on their toes, Stopshoppingdebbie strutted proudly in the saddling area. At one point, in a moment I actually captured on camera, she looked me dead in the eyes as she passed me. Her acknowledging, soulful gaze sent my heart racing: Here, I knew, was a real champion in the flesh. This demeanor and confidence didn’t change a bit when she stepped onto the track, or as I watched from the rail as the horses were loaded into the gate mere yards ahead of me. It was really the first time I’d ever truly watched a horse race and didn’t just wait in the paddock area for more horses to arrive. But now I waited with bated breath and a speeding heart, with eyes locked on Stopshoppingdebbie’s stall. When the gates sprang, and the bell rang clear, the thundering herd of pounding hooves sounded almost primordial as they blew by Emerald Down’s grandstand for the first time. When all of them went into the far turn, I tracked Stopshoppingdebbie even as she became a small figure in the distance. She began to make her move on the final turn, and in the stretch she unleashed a devastating turn of foot that enabled her to draw away from her opponents by several lengths. She made the others look like they never had a chance. Seeing her win was an exhilarating feeling I shall never forget, I even kept the race card containing her race as a keepsake. Where everyone else was going to collect their betting money, I stayed behind to watch Stopshoppingdebbie cool down before she entered the winner’s circle. The winner’s circle was another highlight of the experience. I never knew how close you could get to the winning horse until Stopshoppingdebbie stepped within it. Emerald Downs’ winner’s circle is somewhat more of a winner’s “pit”, as it was lower than the area around it, offering a raised view of the circle. She walked around a few times, letting all who were pressed against the railing, like myself, to observe her from above. Then, she posed, the camera clicked, and everyone dispersed. Stopshoppingdebbie was dismounted, and her tack removed before she left the winner’s circle, I proceeded to follow her along the rail as far as I could while she walked back to her barn. Here one could truly see the impressive physique of this animal. She had a massive shoulder, powerful rear end and a sizable girth. I had witnessed just one race but already I felt like I was in the wake of an idol as she walked off into the distance. A local champion, the first champion I’d ever witnessed in person. I would witness her race one more time before her voyage south to California, where she placed a disappointing butstill respectable fifth in the grade 3 L.A. Woman Stakes at Santa Anita. She retired after her defeat with $249,728 in earnings and a spotless record at Emerald Downs, with nine wins in nine starts and eight consecutive stakes wins at her home track. Currently she resides over half the country away in Georgetown, Kentucky at Town & Country Farms where she now spends her time as a broodmare with the likes of Mo Chuisle (dam of grade 1 winner and U.S. Champion Sprinter, Points Offthebench) and Blushing Ogygian (dam of grade 1 winner and successful stallion, Street Boss). She now has several foals to her name, all by easily my most favorite stallions, and at present is currently in foal to Uncle Mo. There is a light not often shone on local stars as I believe should be. These are the unsung heroes of racing. Horses like Black Caviar or Secretariat draw fans to horse racing. But for fans, being able to see and root for a local champion when you don’t live near a bigger track is what hooks you into the sport. I rooted for Stopshoppingdebbie when she left for California, as the vast majority of Washington State’s racing community did. Here was our state champion off to represent us, a horse we had seen win time and again in person on a regular basis. A mare that kept us going back to the track, wanting for more. Drawing Washington state citizens--from children to teenagers like myself at the time, to young adults as I am now-- into the sport, curious to see the local wonder that was Stopshoppingdebbie. As for myself: I don’t expect to see Stopshoppingdebbie again, but I’m gladdened to have seen her at all, and through her to have gotten a proper introduction into the glorious moments of horseracing. She not only captivated me, but my family and friends who I’d speak to about her and would root for her. She was Washington State’s champion, Queen of Emerald Downs, and our local hero.